During the fall and winter of 2012 and 2013, Ryan W. put together a proposal to build an urban farm, which later became North Brooklyn Farms. He presented it at a Greenpoint Waterfront Association for Parks and Planning meeting, where two neighbors told him about the empty 61 Franklin St. lot, owned by the NYC Housing Preservation and Development (HPD) agency. Ryan started collaborating with Lisa B., who worked for Council Member Steve L. and was co-facilitator for the Participatory Budgeting project’s Parks and Environment Committee. They saw it as a great space for a neighborhood garden that might be eligible for funding from the Greenpoint Community Environmental Fund. Members of Open Space Alliance, 596 Acres, the Brooklyn Community Board and New York City Council, as well as Greenpoint neighbors, met with Ryan and Lisa at Le Gamin in January 2013 for the first community stakeholder meeting. Monthly meetings followed, with over 30 people working to gain momentum and put together the requirements for establishing a GreenThumb garden. In March, they presented the garden proposal to the Community Board to obtain a letter of approval. Ryan and Lisa then submitted the application to GreenThumb to officially register the garden. Garden members quickly gained access, with HPD cutting the lock on May 15, 2013. Soon after, a full day of work began as several members met at the lot to remove the waist-high weeds. Within a couple weeks, Ryan brought wood from Build It Green to make the first raised bed, and a delivery of topsoil was purchased to share with Java St. Garden. Rocks and bricks that had surfaced in the lot were placed as borders to form a sunflower garden in the front part of the property. Some hostas were donated from a neighbor to plant on the shady south side of the lot. After a successful fundraiser at Diamond Bar, the garden had about 14 members and was growing. North Brooklyn Runners were invited for a work day and about 35 athletes made quick work of leveling the lot and putting down cardboard boxes and coffee sacks covered in city-donated chips keep the weeds from resurfacing. They also painted over the graffiti. The garden was cleaning up nicely! Without its own water supply, neighbors donated their water supply until a hydrant permit could be obtained. A middle perennial flower bed was created and finally, a tool shed was built in the back of the garden. 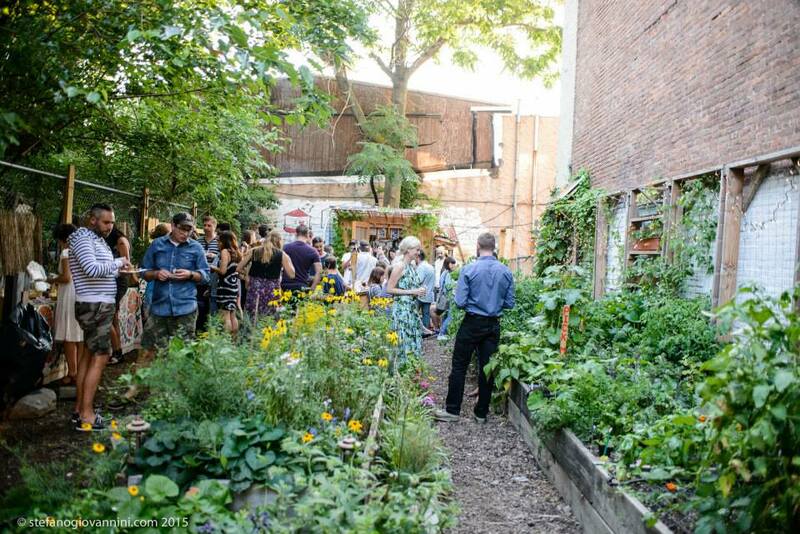 When a charcoal grill moved in, the garden was ready for more members and events. In the winter of 2015 the garden signed a 4 year parks lease with the city and became an official NYC park.